The OCI™-1000 & OCI™-2000 from BaySpec are the new handheld hyperspectral imagers. These devices are the first hyperspectral imaging systems in handheld form factors that weigh less than 1.0 lb. They are designed to acquire full and continuous visible-near infrared (VNIR) hyperspectral/multispectral data for a variety of applications requiring fast acquisition speeds. The OCI™-1000 integrates high-end hyperspectral imaging capabilities on an image sensor at the level of the chip itself. This creates a smaller size for installation in almost any application, and removes the need for expensive, bulky, and complex optics. 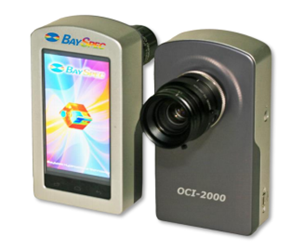 The OCI™-2000 uses a snapshot hyperspectral imaging method, which captures spectral images in a snapshot of less than 30 ms so that no scanning is involved. Snapshot imaging simplifies data processing and improves process time by avoiding motion artifacts. Key features include point-and-shoot-imaging, a self-contained system with a touchscreen computer, and options for different objective lenses for varying fields of view. The OCI™-1000 & OCI™-2000 can be used in a variety of applications including food quality sorting, agriculture, remote sensing, medical diagnostics, forensics, security, and counterfeit detection. For more features, specifications, and applications, download the available datasheets.